Whippets are a breed dog dogs that were bred to hunt game at high speeds up to 35 MPH. 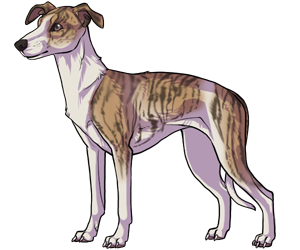 They are a evolved cross between the Greyhound and the italian greyhound, with its creation just dating back to the 19th century. The whippet was first brought here into the Americas by some English mill operators from the state of Massachusetts, to where as it was another popular area to gamble in whippet races. The Whippet was recognized by the AKC in 1888. These dogs where often used as racing dogs in England and were dubbed as "The poormans racehorse". This dog has been known to do a fine job as a watch dog.